The Traverse City Film Festival, , features new releases, classic films, documentaries and independent productions. Venues include the State Theatre, City Opera House and outdoor movies at the Open Space. Founded by filmmaker and local resident Michael Moore, this unique festival is held in one of the most beautiful areas of Northern Michigan and the country. Created in 2005, it has grown to become one of the largest film festivals in the Midwest. Special emphasis is given to foreign films, American independents and documentaries. 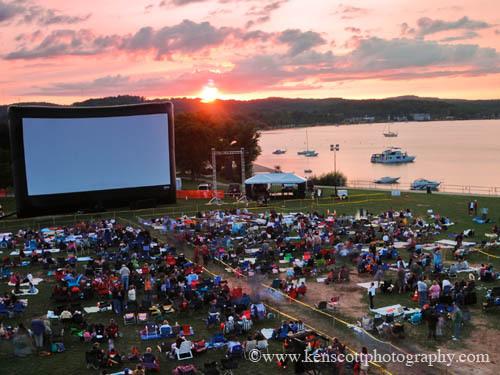 The festival also present classic movies at no cost at dusk in Traverse City's Open Space Park. In addition to the films, free panel discussions with directors, writers, actors and other members of the film industry are offered daily and there is an affordable film school with daily classes. The Old Town Playhouse, home to the Traverse City Civic Players, is located three blocks from downtown Traverse City. Performance areas include a 358-seat main stage auditorium and an 80-seat studio theater. The Lars Hockstad Auditorium is located in the historic Traverse City Central Grade School. Recent renovations include 750 new seats, making this the largest indoor venue for the film festival. Constructed in 1891, the City Opera House, was reopened in the 1980s after being closed for several decades. The restoration campaign had a goal of creating a community cultural center. Recent updates include a new grand entrance and balcony seating. The 367-seat Milliken Auditorium at Northwester Michigan College hosts a variety of concerts and productions by performing arts groups throughout the year. The Dutmers Theater with 35 seats, also inside the Michael and Barbara Dennos Museum Center, is used tfor documentary and experimental screenings with smaller audiences. The Open Space Outdoor Cinema, corner of Union Street and Grandview Parkway, is an ideal venue to enjoy a free outdoor movie during the Film Festival. For more information, see www.TraverseCityFilmFestival.org and make your plans to attend this great event in northern Michigan!